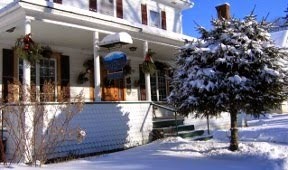 My name is Lynda Graham, owner of Vert Le Mont B&B in Sutton, Quebec. Here at My Sutton Life I share my knowledge, tips and suggestions to help visitors get the most out of their trip to Sutton and the Eastern Townships. Winter hiking and cross country skiing in Sutton. Not everyone is a down hill skier but that shouldn't stop you from enjoying fresh air and the lovely scenery around Sutton all through the winter. Depending on the weather you can cross-country ski, snowshoe or hike. If the snow is good then head to pleinairsutton.coop (previously Sutton En Haut). Best known for its cross country ski trails, it also has 15km of beautiful forest trails for snowshoeing and hiking plus access to Lake Mohawk - a terrific hike if you have at least 4 hours available. Located on Maple half way between the village and Mont SUTTON they have good snowshoe and cross country ski equipment rentals too. Give the Sutton Tourist Office a call (1 800 565-8455) for opening hours and conditions but they are normally open daily except for Mondays and Tuesdays. Continue up Maple and bear left onto chemin Real to get to Parc Sutton. This important environmentally protected zone offers around 50kms of trails for hiking and snowshoeing. Their trails are primarily on the flanks of the Sutton massif i.e. you are nearly always climbing or descending so small snowshoes or crampons plus hiking poles are a really good idea. On the other side of the mountain, about 15 minutes from Sutton, is Au Diable Vert. Good hiking and snowshoeing trails plus the possibility of cross country in open forest that is mainly level. Note that the final section of the access road is very steep so unless you have a 4 wheel drive vehicle you should plan on using the lower parking lot (clearly indicated) and walking the 10 minutes up to the lodge. They have snowshoes for rent. At weekends call in advance to reserve rentals. Continue 20 minutes on past Au Diable Vert, turning left at Dunkin, to reach Reserve naturelle des Montagnes-Vertes. As yet little known, this beautiful area offers 3 hiking circuits of increasing length and difficulty mostly using former logging trails. Terrific for a full day out but take snacks etc as you will almost certainly be there on your own. Micheline shows off her crampons. When there is fresh snow it is just a delight to snowshoe, but once trails are packed down crampons really come into their own especially when conditions are icy - even on level terrain. On a day out last year with my friends Micheline and Dan, they were firmly attached to the ground by their crampons whilst in my boots I was slip sliding all over the place and ended up with a large bruise on my shin to prove it. So, whether or not we are up to our noses in snow, there is no excuse for staying at home. Get out in that fresh air! Hiking is also cheap - a daily access ticket to the places above all cost $6 or less. Here at the B&B I have day passes, crampons for rent and winter hiking packages for all four locations, The Sutton tourist information office at rue Principale opposite the Town Hall sells Parc Sutton tickets and has good information and maps. Here is my annual low down for getting the best deals for skiing at Mont SUTTON for winter 2014-15; note that in all cases you have to add the 15% taxes. As a start point a regular one off adult lift ticket for a day is C$60 but read on for the cheapest ways to ski Mont SUTTON including a day for just $5! 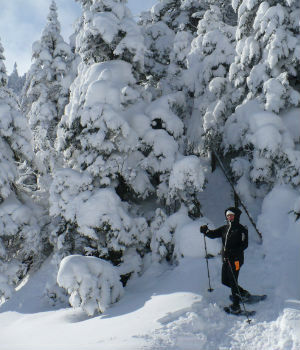 Ski SUTTON "Like nowhere else"
If you can stay a night or two then the Forfait Neige is an unbeatable value ski package. For $89pp you get a day and a half of skiing along with a night's lodging and breakfast. 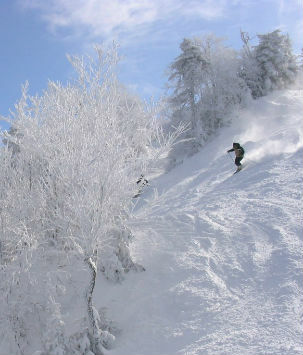 For $159pp you get two and a half days of skiing and 2 nights lodging n.b. this package is only available Monday to Friday (the mountain sets the rules not me). This offer is available here at Vert Le Mont B&B as well as a number of other lodgings in Sutton but they don't offer complimentary hot chocolate and home made cookies (just saying). For more info go to my Sutton ski package page. People aged 50 and over, men and women can ski for just $25 on Tuesdays, Wednesdays or Thursdays respectively e.g. men on Wednesdays, between January 6 and February 19 2015. Not much time? Half day tickets are pretty expensive-about 80% of the full day cost- but you can ski from 3pm every day of the week for just $15. If you are a beginner the Iniski initiation program gets you equipment rental, a 90 minute private lesson and a lift pass for to the Family Zone for only $85. If you have a bit of experience the $110 Discovery-ski program gives you the same things but with a lift ticket for the entire mountain. TIP: Schedule your lesson as early in the day as possible to get the best use from your lift pass. You can also ski the easiest section of the mountain for $22 with a ticket that restricts you to the 2W and 3 chairlifts. Deals at the weekend are few and far between. So make sure to get a free Carte Blanche loyalty card which gives you 10% discount your first visit, 20% the second and so on up to 40% with your fifth visit free. These cards are good for Mont Sutton, Owls Head and Smugglers Notch. I have these cards here at Vert Le Mont B&B or else try Sports Experts stores or the Sutton Tourist Information Office. These passes are NOT available at the ski hill. Every year on 17 December Mont SUTTON celebrates its birthday by letting people ski for just $5 - the 1960 price! The summer is here at last and along with it my updated list of my own Top Ten favourite things to see and do in and around Sutton, here in the beautiful Eastern Townships of Quebec. Just so you know, I have discounts for most activities for my guests here at Vert Le Mont B&B. 1. Hike the Moose Back. There are over 250km of trails and circuits of all types of difficulty and length across the Sutton massif. Best known is the Round Top circuit but if you want to avoid the crowds yet still have some great views head instead for the Dos d’Orignal trail which you can make into a 3 or a 4 hour circuit. 2. Visit a vineyard. Sutton is located on La Route des Vins – a signposted route linking 18 vineyards. Each has their own particular attraction but I particularly like Domaine des Côtes d’Ardoise for its beautiful outdoor sculpture exhibition, L’Orpailleur for its wine museum, Domaine Bresee (right on our doorstep) for its delicious rosé and Chapelle Ste Agnès for its breathtaking location. 3. Go for a bike ride. With its rolling hills Sutton is not for the faint of heart but there are easier options available including Sutton to Abercorn and back, the lovely Missisquoi Valley Rail Trail that starts in Richford, Vermont and the Estriade bike path circuit. La Vie Dehors in the village has good bike rentals. 4. Drive the Townships Trail. This sign posted route will take you through some of the Townships loveliest scenery and lead you to some of its prettiest villages. From Sutton you can follow the Trail through Mansonville to the Abbaye de Sainte-Benoît-du-Lac where you can listen to the Gregorian chanting and buy some cheese! Afterwards continue on to Magog and return via Lac Brome (Knowlton). 5. Kayak the calm waters of the Missisquoi River. No experience is needed to spend a day floating along this beautiful river at your own pace.Canoe & Co are the friendly and helpful company that we use for our B&B guests. 7. Zip through the trees. If you have a head for heights VéloVolant at Au Diable Vert is not to be missed. Glide through the treetops on a suspended recumbent bicycle which travels only as fast as your pedal strokes. VéloVolant is the highest of its kind, supported by towering maples and pines. 8. Take in a show. The Salle Pelletier at the bottom of rue Maple has an interesting program of movies and live shows. Nearby, the village of Lac Brome (or Knowlton as it is more commonly known) has a program of English language plays and music Wednesdays to Saturdays throughout July and August, with both matinees and evening shows. Shows at Theatre Lac Brome are generally of a good quality and very entertaining; tickets are $32 or $36. 9. Visit an art gallery or exhibition. Sutton has a huge number of artists. You can see their works at the galleries along, and just off, rue Principale by following the Plein’Art walking circuit (Thursday to Sunday). At the Sutton museum there is an interesting exhibit about local Rocket Man Gerald Bull which is open on Saturday and Sunday afternoons. 10. Go for a picnic. In the middle of Sutton’s rue Principale, speciality store La Rumeur Affamée has a wonderful selection of local cheeses, cold cuts, breads and quiches. Wash it all down with a bottle of wine from Domaine Bresee. Finish with some Belgian chocolates from chocolaterie Belge Muriel or a macaroon from Dessine Moi Un Pain. Nice picnic spots include La Marmite aux Sorcières, Lac Spruce, Au Diable Vert and, if you are a guests, under the pergola here at the B&B. I moved to Sutton in Quebec's Eastern Townships ten years ago and bought my B&B 'Vert Le Mont' in November 2004. I absolutely love my life in Sutton and in this blog I hope to share some of the reasons why along with tips for getting the most from the area, favourite B&B recipes, latest B&B news and anything else that I hope will be of interest for fans of Sutton and Vert Le Mont B&B. copyight L.Graham. Simple theme. Powered by Blogger.